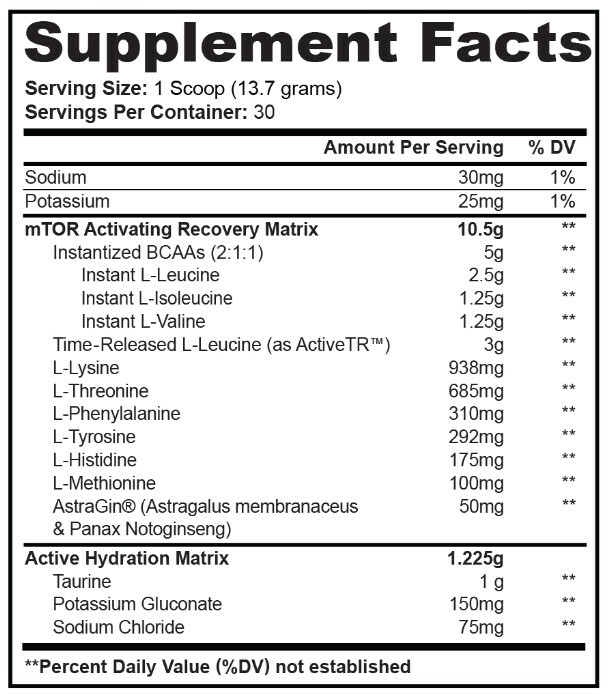 BOOST MUSCLE GROWTH & RECOVERY: mTOR promotes lean muscle growth with 5g of instantized 2:1:1 BCAAs L-Leucine, L-Isoleucine, L-Valine and EAAs: L-Lysine, L-Threonine, L-Phenylalanine, L-Tyrosine, L-Histidine, L-Methionine. ACTIVE HYDRATION MATRIX: We've added Taurine and Electrolytes to keep your muscles hydrated to increase efficiency of your muscle recovery. GREAT TASTE: mTOR PRO tastes incredible and comes in 3 mouth-watering flavors: Fruit Punch, Blue Raspberry and Mango Lemonade. This intra-workout supplement will quench your thirst and increase your muscle recovery at the same time.